As a blogger, I'm usually pretty swamped with work. I typically have posts scheduled for weeks in advance and rarely have time for much else. However, I recently ran into a situation that made me so livid, that I knew I had to bump a few posts around to make this one top priority. It's *that* important. I frequent so many conventions and have become friends with so many people, both celebs and artists alike. I support a lot of artists and make it a point to compliment them on their work even if I'm not able to purchase it. I mean, I also am pretty artistic, but I'm no where near as good as a lot of these artists I run into at conventions. The work I stumble upon is off the wall incredible! One of my favorite artists is Tim Shumate. You've probably seen his work around a lot and didn't even realize it. I've purchased a lot of things with his artwork on it, directly from his site, however, I've seen many sites which produce items and ship from Singapore use his artwork. While a lot of artists will allow some companies to use their work with their permission, it's never for free. A lot of companies will just find the artwork online, mass produce clothing, decor, and prints with the art on them, and not even so much as credit the artist. More importantly, the artwork, because it's been copied off the internet, is ruined from resizing and the printing process. Making all the artists hard work look like crap and who wants their name attached to something that looks bad? That being said, buyer beware, GeekPaintings is one of these sites! Look, if you're a nerd, you've probably seen a sponsored post for this company pop up in your Facebook feed. That's where my husband and I came across it. He tagged me in a photo to alert me of a possible Christmas gift idea. 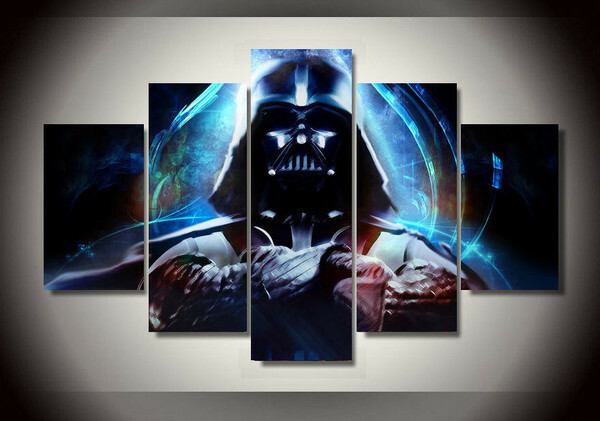 The photo was of a multiple canvas print of Darth Vader across 5 canvases and I was blown away. Not only was it a gorgeous set, but it was only $35! So I was like, "Alright, lets do this!" I know I'm going to ruin the surprise since this is a Christmas present, but this needs done. This is a photo of the paintings I ordered. Admittedly, my skepticism came pretty early on, but I like to give people/companies the benefit of the doubt. At the time, I had not seen anything negative about the company, so I went on to purchase this set a few weeks after I had initially seen it. Now the price was $45 instead of the initial $35. Ten dollars more, no biggie. They now gave two options that weren't there before which was framed (an extra $35) and not framed. There was literally no description for this item except that it was "hand painted" on canvas. So naturally, we thought framed meant, you know, with an actual frame around the object, like a photo frame, and unframed meant it was just the canvas stretched across wood. A month went by and we were still waiting on the painting to show up. We got no tracking number, just an email stating it had been shipped and to expect it anywhere from 10 days to 30 days. THIRTY DAYS?! This was a Christmas gift, I couldn't wait 30 days for it to arrive! I went to the site to look for contact information and find out where exactly these paintings were coming from. Would you believe that I found absolutely nothing? There was no way to contact this company in any manner and absolutely nothing about the company or where these items were shipping from. I became increasingly unsettled by this. What made it worse, is that a week later, a contact form magically showed up in their site where there wasn't one before. Now it was just getting weird and I was getting agitated. My husband contacted them with our order number and the inquiry on the status of our order. We never got a response. Yesterday, this package mysteriously showed up on my doorstep. And even after I opened it, I still wasn't sure what it was until I unrolled it, because let's face it, this was NOT what I was expecting. Once I unrolled it, I was appalled. The painting was grainy. And yes, I'm aware that it would look grainy on a canvas, but it should not be this grainy. This is the type of grainy you get when you find a photo on the internet in a small pixel size, try to resize it, and adjust it to a much bigger pixel size. In short: It's pixelated as all get out. Oh but that's not all! Their site stated these were "hand painted", and as you can tell, that's a flat out lie. These were clearly printed on a machine, not hand painted. Yeah, they were hand painted at one time by someone, but these particular paintings certainly were not. These were mass produced in a factory in Singapore. They were nice enough to leave a border around the canvas so that you can stretch them onto a wooden frame yourself (gee, thanks), but because they are a print of a painting, they are super glossy. A real painting is not this glossy. I had the hardest time just getting these photos because of the glare these things emit and my husband and I attempted to see what it would look like on the wall, and even from far away, it was so glossy that you could barely see the picture. So if you decided to put these in an actual frame instead of stretched over wood, you're going to run into double glossiness between the photo and the glass of the frame. I did go back to the site and discovered that they now show the difference between framed and unframed, which was not there when I ordered, making me believe that they have had massive complaints about this from other customers. At first I though I was just being picky. So I went onto their Facebook page to discover that I'm not the only one with this problem. There are many unsatisfied customers and to be honest, it looks like I actually got a pretty good print compared to what others received. Like the guy who ordered a different Star Wars print and ended up with an Asian Vader and a Yoda with no face! I'd show you a picture of it, but GeekPaintings removed his comment with the photos from their Facebook page. SURPRISE SURPRISE!! Also, I posted about my unsatisfactory experience on their Facebook page and that magically disappeared as well. As a matter of fact, all posts that were on their page and in comments that mentioned this company being a scam have been removed. Instead of the company asking people to email them so they can discuss this issue farther, like most companies do, they just flat out removed anything that didn't make them look like their crap smelled of roses. This morning I received a message that sent me into a whole new detention of p***ed off. I checked out this artist's profile on this Fine Art Site, and sure enough, there was the original paintings! Yes, you have to purchase them separately and yes they are far more pricey, but you know what? This guy worked really hard on these hand painted pictures and this is the price that REAL art goes for. I know there are some who are going to say, "Well if I can get it cheaper some place else, why wouldn't I?" You could, but you shouldn't. You know why? Because the quality of the knock offs is going to be muffed up and not even worth it. Also, and more importantly, this guy doesn't put food on his table and pay his house payment or rent from the money you pay to another company for a cheap copy of his work. He gets NOTHING for his hard work. As a blogger, I have run into this on a much less offensive level. There are bloggers who have copied the graphics that I spent 8+ hours on and claimed them as their own. There are bloggers who will copy and paste other blogger articles and reviews onto their own blog and/or Amazon profile and claim them as their own. These people are the lowest of low. Stealing the artwork of another person and reselling it as your own is ILLEGAL! I am currently working on finding the other artists who's images were stolen by this company and making them aware of this injustice so that they may take legal action against this company. If you put aside the fact that they are thieves (and you really shouldn't because that's the absolute worst part of the entire thing), focus on the fact that you are paying this much for something that isn't even good quality! As a matter of fact, the images they present in the photos on their site show the canvas paintings being so big that they would span the length of a full sofa, when in reality, the paintings are so small that all of them fit in a standard poster frame. I know this because I actually did put them up to a poster frame to see how much smaller they were in reality compared to how they are presented on the site. Please, DO NOT endorse this site and by all means, please share this to get the word out! Imagine if you were one of the artists having their work copied and resold without your permission. Nothing fires me up more than seeing a hard working person (no matter what field of work you are in) have their work taken from them and someone else taking the credit for it! Thank you so much for this post! I only wish it had come sooner! The one I ordered for my husband is already on the way (thus can't be cancelled). I'm disappointed to see this. I wouldn't have supported the website if I would have known they were knockoffs of some mans hard work. I guess we will just have to wait and see what I actually get when the work arrives. I'm curious about how the original artists get the rights to use the images. I keep hearing a lot about companies cracking down on copywrite infringement. That's one thing that has kept me from doing much fan art. It depends. You would be surprised by how many of these artists work for (or have worked for previously) the companies that own the characters. Comic book artists are a good example. There are a plethora of character comics that aren't owned by the company that owns the characters, but the publishing company is able to buy a certain amount of rights to publish them ad have different artists do their take on the characters. They are allowed to sell their artwork long after no longer working for that company as long as the image is not altered in any way. For instance, I met the man who does the characters for the Dora the Explorer books. Nickelodeon owns the characters, but since it's his artwork in the books, he is allowed to sell prints at conventions and do special custom drawings, but when asked, he was not allowed to draw a "Zombie Dora" and had to keep the character exactly as it's produced or he would face legal problems. I also received horrible prints from this site, I wish I would have seen this page two months ago. I'm now trying to get a refund for my prints, mine weren't even shipped in a tube but in a regular plastic shipping bag and the canvas was secured with tape which made it fray when removed. How is this site still in business if this is illegal? Please share with others. The company has blocked me from posting this on their Facebook page. It's been reposted by many others and they just keep deleting it. They don't want anyone to know that they are stealing artwork and reproducing it at such low quality then charging people an unreasonable price for shoddy reproductions. I wish 8 would have found this article before I ordered. I got my order today and it looks so bad. My post was deleted within five minutes, so I tried again.